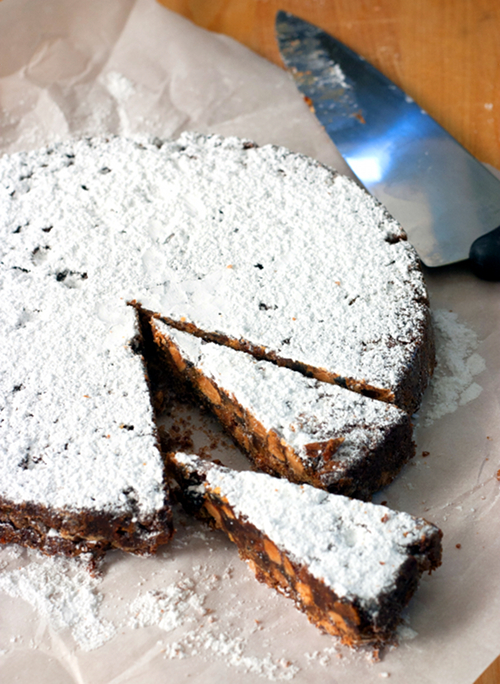 Don't roll your eyes on a Christmas fruitcake, especially if it's Panforte, Italian Christmas fruitcake. 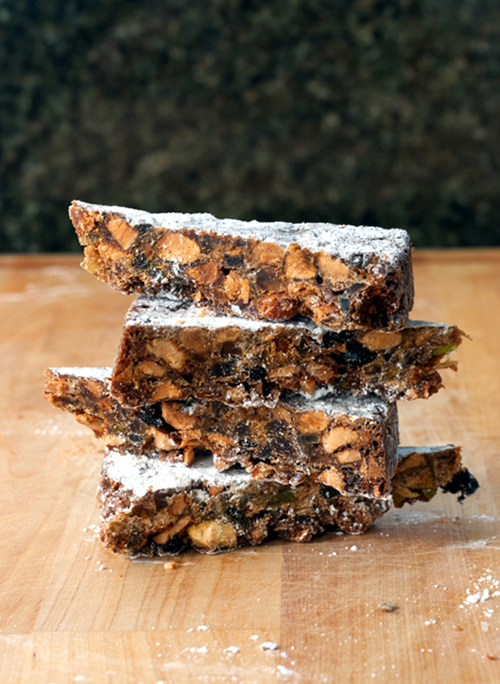 Originated from Siena, Tuscany, Italy, this scrumptious fruitcake/candy is fragrant, a little bit spicy, a little bit chewy and not like any other fruitcake you ever tasted. Enjoy with espresso or cappuccino. Preheat the oven to 300 degrees F. Line 2 baking sheets with parchment paper. Toast hazelnuts and almonds in separate baking sheet until the turn golden brown. Set aside to cool down. Remove the skin from the hazelnuts by placing some in the center of a kitchen towel, and rub them together until the skin falls off. Chop the nuts coarsely. In a large heatproof bowl, mix together, nuts, candied, peels, cocoa powder, flour, ginger, cinnamon, clove, nutmeg, pepper and chili powder using a rubber spatula until well mixed. Grease an 8-inch cake pan, and line the bottom with parchment paper. Sprinkle some powdered sugar on the bottom of the pan. In a medium saucepan, whisk together sugar, honey and butter until well combined. Cook over medium heat, bring to boil. Reduce the heat, insert a candy thermometer and continue cooking (without stirring) until the temperature reached 240 degrees. Pour the hot syrup immediately over the nut an fruit mixture. Stir to combine as fast as possible, as the mixture will start to stiffen up. Use your hand to mix it a little more, then transfer immediately to the lined cake pan. Spread the mixture evenly and smooth the top of the cake. Bake in the oven for about 35-45 minutes. Take the cake out of the oven, transfer to a wire rack. After about 15 minutes or so, release the sides of the pan using table knife. Flip the panforte out to a parchment paper so that the bottom part is now facing up. Dust heavily with powdered sugar. 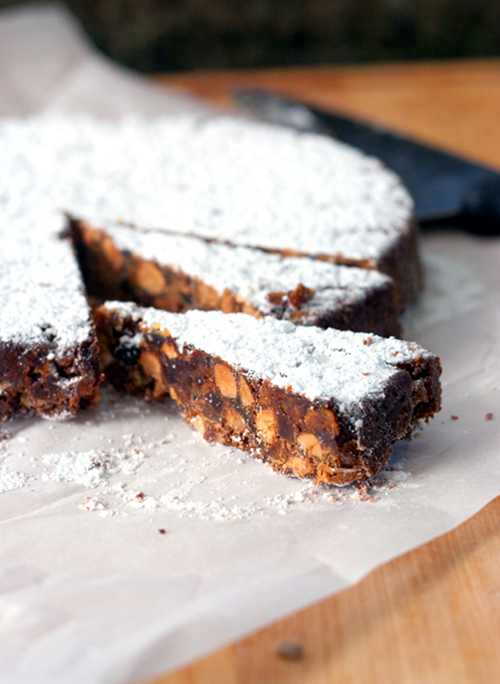 Let Panforte to cool completely before wrapping. The cake, if properly wrapped, will last for a few months. To serve, cut in thin slices. I wouldn't stop just eating one! O my...I love NUTS! Mmmmmm that just looks wonderful. Almost as good as the best fruit cake ever!